If you build it, they will come. And for motorcycle travel, if we install travel bags or cases on our motorcycle, we will fill all that space with gear, and then attach something more to it. More often than not, we will start our travel with more gear than what we really need. We want to be prepared for the unexpected, right? But we also know that the more we carry and the more weight we add to our motorcycle, the more we modify its characteristics. After many years fiddling with luggage systems, I think I found an ideal set up, something that will help us in limiting how much we carry, carrying our gear securely and efficiently on the bike, and I want to share this set up with you. I really enjoy taking a motorcycle out for a quick spin on the nice roads just out of town, carrying almost nothing on the bike, except for camera equipment and the basics to fix a flat tire. In 10 miles or less and I’m already on the open curvy roads or on a nice gravel road. 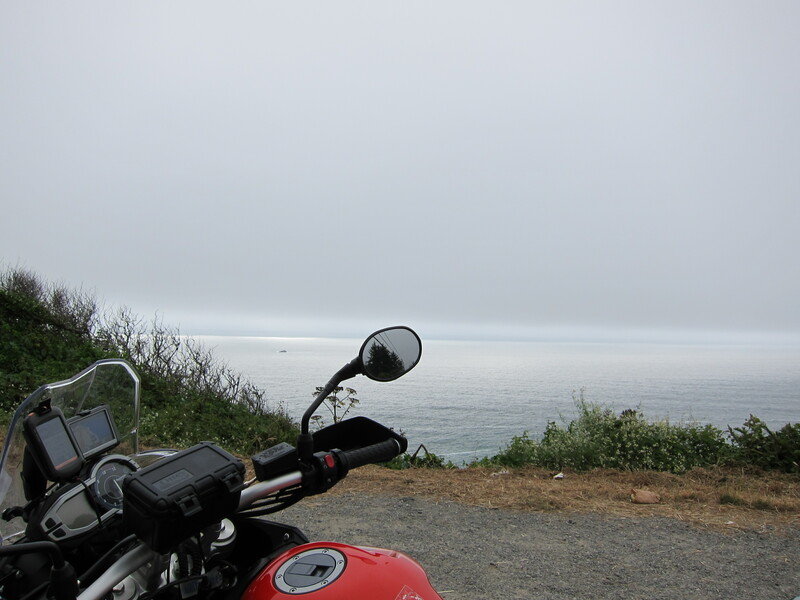 I can leave at noon, ride to the coast, enjoy the ocean, and be back home for dinner. 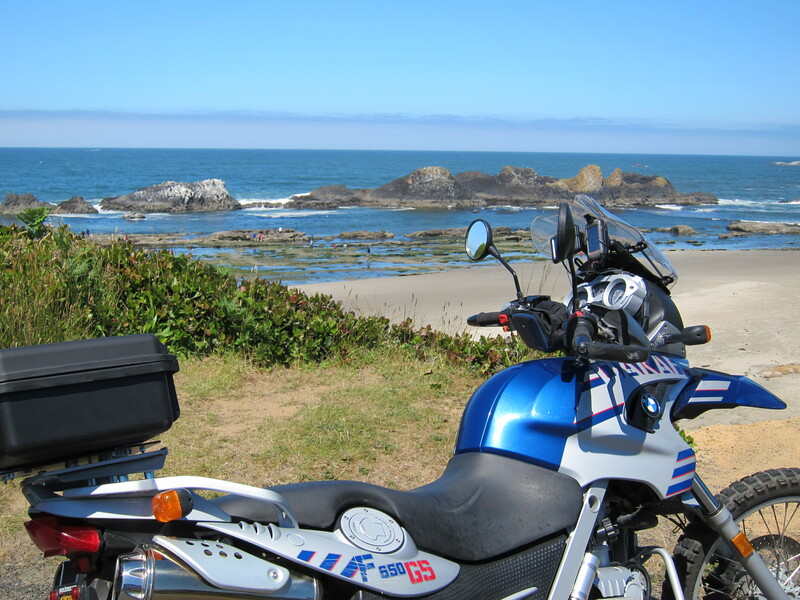 The Dakar at the Oregon Coast. It was July, 2011. Does it really gets this sunny around here? Or what about a nice loop going East toward the mountains and enjoy the nice curves and switchbacks going up on the Cascades, have a cup of coffee or two in the town of Sisters and be back home before dark? Those are the times when the bike is performing at its best. The Tiger on McEnzie Pass. That was September 2011. It really gets sunny here, at some point. 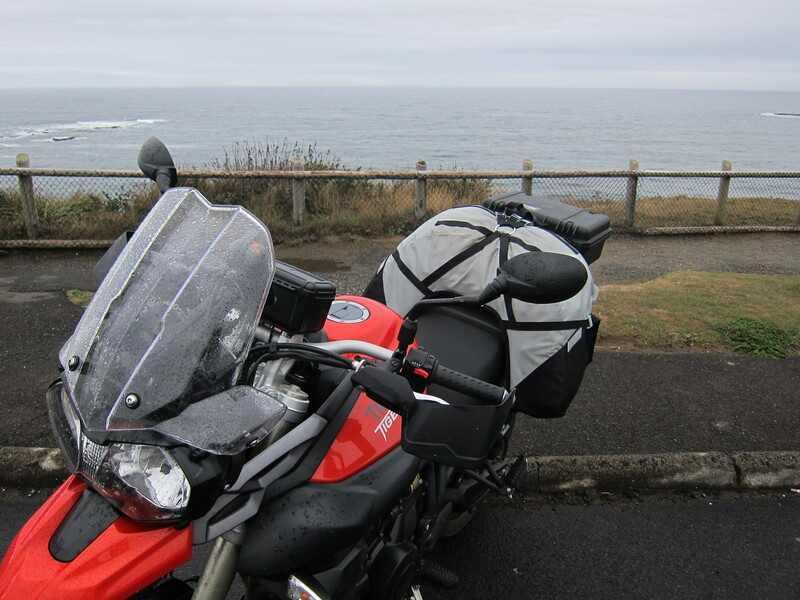 But more than once a year the motorcycle is my companion for longer distance, multi-day travel. It is me, the bike, and my camping gear. Ready to stop only when it is time to stop. A man and his ride. 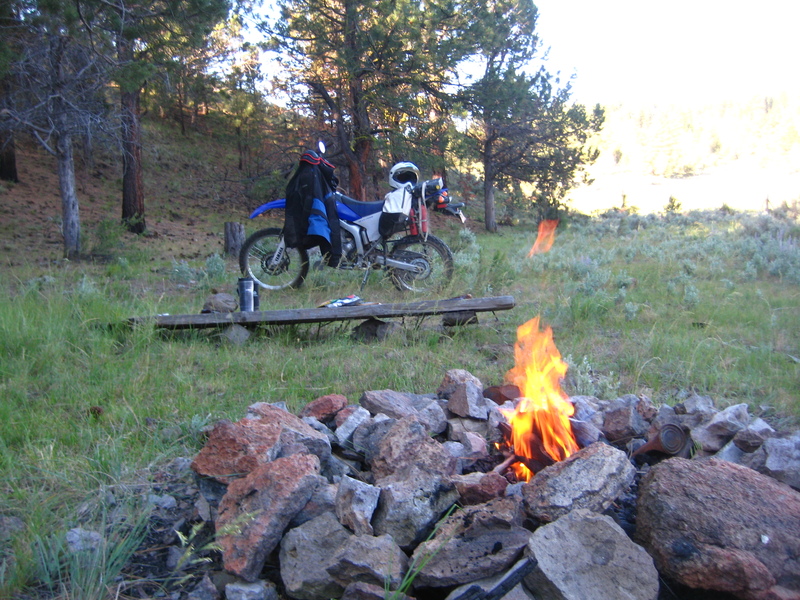 The Yamaha WR250R somewhere close to the Ochoco Forest, Oregon. That was July, 2010. What makes it so great about traveling on motorcycle is that they are fun to ride, they are nimble, fuel efficient, go anywhere vehicles. That’s what makes them great adventure machines. However, things change when we need to carry a tent, camping gear, tools, and anything else that we may need for a long distance, multi-day, self-sustained trip. No matter what, the bike’s performance will be changed. But according to how much we carry and how we accommodate our gear on the bike we may actually not lose much of the motorcycle’s capability for adventure. So what is the best approach to take what you need with you and not compromise the fun part of the ride? There are three main ways people carry their travel gear on motorcycle: hard cases, soft bags, or a combination of both. For many, the idea of hard cases is synonymous with adventure. This BMW F800GS (on the left) is fitted with Jesse side and top metal cases. You see many bikes with such cases. To do so you need to add racks to secure the boxes to the frame of the motorcycle (or subframe). The rack and the boxes add a good amount of weight to the bike. In summary: 1) they add weight to the motorcycle; 2) the weight is at the wrong end of the motorcycle; 3) these boxes expand the area of the motorcycle that needs to cut through the air, and 4) the boxes give us space, perhaps too much space that we will fill to the brim, and in most cases, we will bungee stuff to top of the boxes as well, since they offer great top surfaces for that. If these four reasons are not enough, it is known that these boxes can be dangerous to a rider or to a motorcycle in case of accident. I’ve heard a few stories of guys who, when they had to put a foot down for balance or something when the bike was moving, their leg got caught and wedged under the side case and the leg got seriously injured, even broken. And what about the stories when the bike crashed, the hard case hits the ground first and the impact is transmitted directly to the racks and from there to the bike frame. A bent frame or worse, a broken frame or subframe can be the end of a story. Or the beginning of an expensive story. That’s why I prefer to stay away from hard cases. Te exception to this rule happens when traveling with a passenger. In this case, I would probably select hard cases made by Jesse as the one on the photo above or the Caribou cases, using Pelican plastic boxes, as the photo on the right. 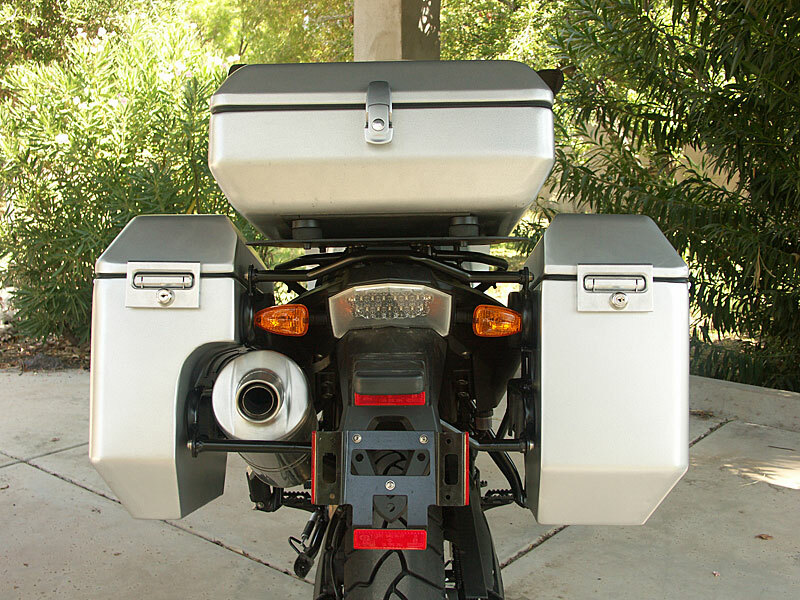 Both the Jesse and Pelican offer cases that are narrow so they do not interfere as much with the bike’s profile. And I find them to be the best looking cases, or the ones that offer the least intrusive look among the hard case options. And there are many hard case options out there. There are also a few soft bags that are attached to the sides of the bike, and require a rack or metal frame for the attachment. My preference is to stay away from these boxes. When carrying my traveling gear, and traveling solo, I prefer the options that do not need any metal paraphernalia, and the Giant Loop bags are the best option out there. 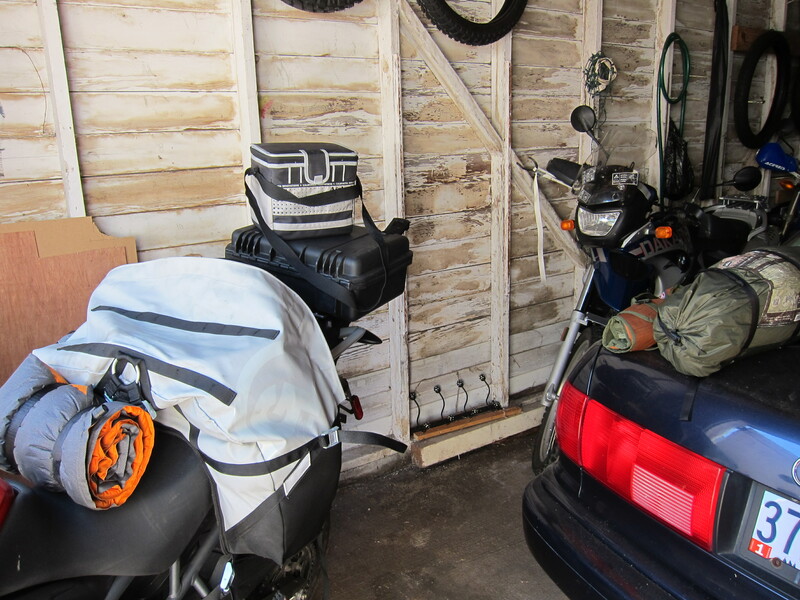 You can load the bag outside of the bike, take it to the bike and it will fit nicely where the passenger would seat. For the smaller Coyote bag, a three-point quick cinch process and you are all set. I have the Coyote for the Yamaha, for my desert rides. This bag also allows me to attach another smaller bag to it for my tent and sleeping bag. Everything is well secured. The White Coyote installed on the WR250R. Photo from July 2010. These bags generate the least amount of impact on the bike’s performance: 1) they are very light; 2) they do not require racks; 3) they are slim, almost conforming to the rider; 4) whatever you carry on them, the weight is carried closer to the rider, more on the middle of the bike, and 5) because of the bag’s shape, overlapping the rear of the bike’s seat, they are secured really well to the motorcycle. When I ride with these bags on my bikes, I don’t even notice they are there. They don’t move! And if you drop your bike, they will cushion the impact. 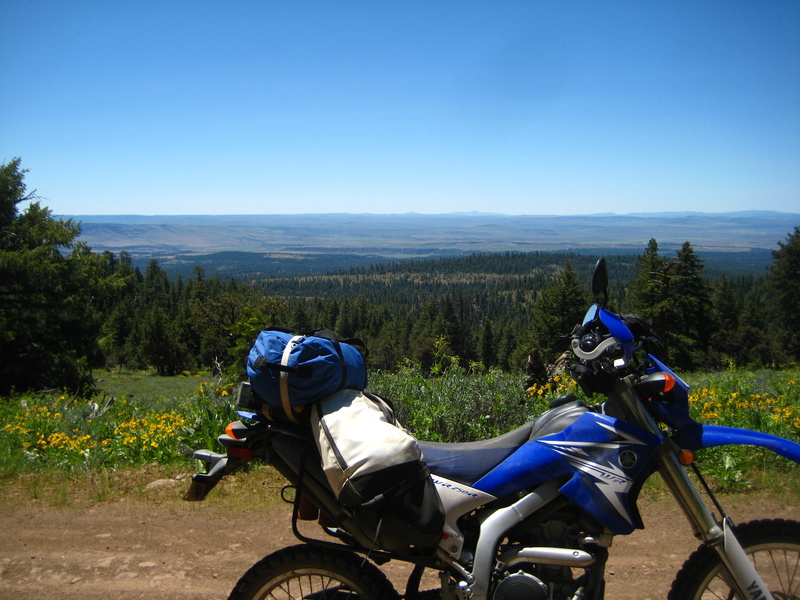 If you are really serious about adventure riding, and will be traveling on dirt roads, including washboard gravel roads, where the terrain will be challenging for the motorcycle and racks, my recommendation goes to the Giant Loop bags. Here is a video where I’m riding the WR250R on some rough terrain with all the gear as on the photograph above. Or this other video (below) I hit a tall cattle guard at a good clip, got me some air, and my gear, safely arranged with the Coyote Giant Loop bag, did not move. Great Basin bag installed in the Dakar. Photo from September 2011.
and the Tiger. By the way, the Tiger photo below shows what I carried with me on a five-day trip. It includes camping gear (stove, tent, pad, sleeping bag, and sleeping bag insert). Great Basin installed in the Tiger. Photo from September 2011. The bags are waterproof, by the way. And the Great Basin has a compartment on the top that perfectly fits my small cooler. Packing the Great Basin. Check the small cooler. Photo from August 2011. 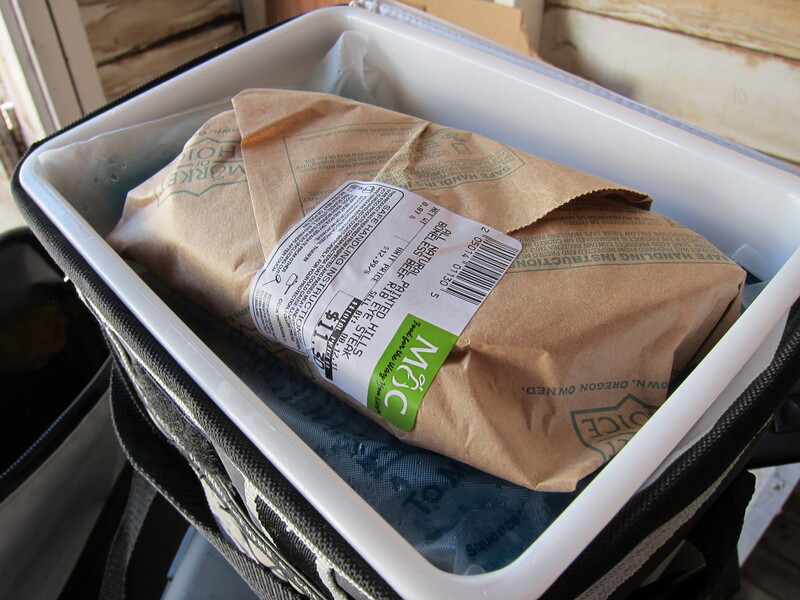 On this particular trip on the photo above, I had in the cooler: four beers, a nice rib-eye steak, and a container with potato salad. By the way, barbecuing that rib eye with rock salt and serving it with potato salad is the perfect meat and potatoes dinner, in my opinion. The steak on top of the beer. steak dinner, and cold beer. Of course, the real point here is that they were glad I did not have to bum them off for much of their beer. I really like this discovered feature on the Great Basin, allowing my small cooler to fit in it like it was made for it. And it is of easy access as well, since it is on top. So if you stop to get your beer (or meal or both) before finding your camp location for the night, this is the perfect, strategic location for a six-pack or dinner or both. 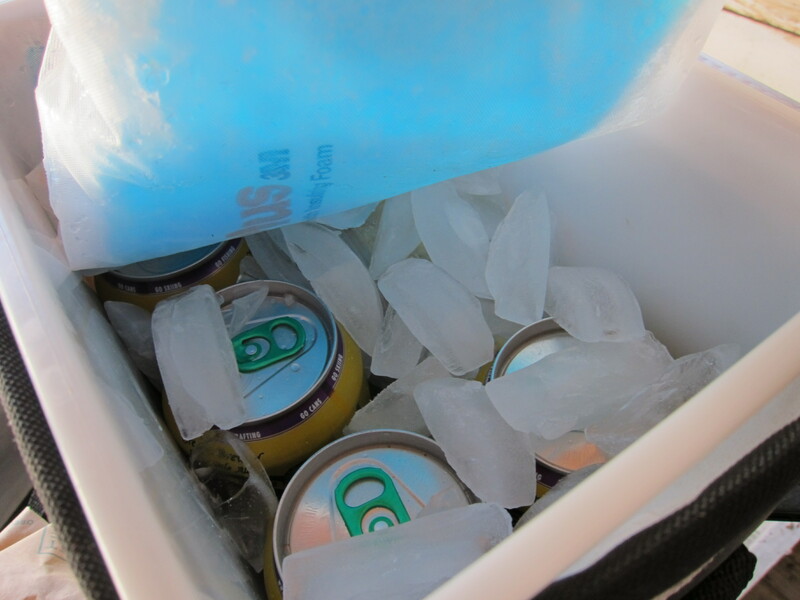 The perfect location for a small cooler in the Great Basin. Photo from August 2011. Back to the subject, when traveling with the bigger bikes, I like to combine the Great Basin with a small top case, a Pelican box. It is the Pelican Storm, IM 2200. It is small enough that I don’t have any extra space for anything superfluous. The tent goes in between the Great Basin and the Pelican box. 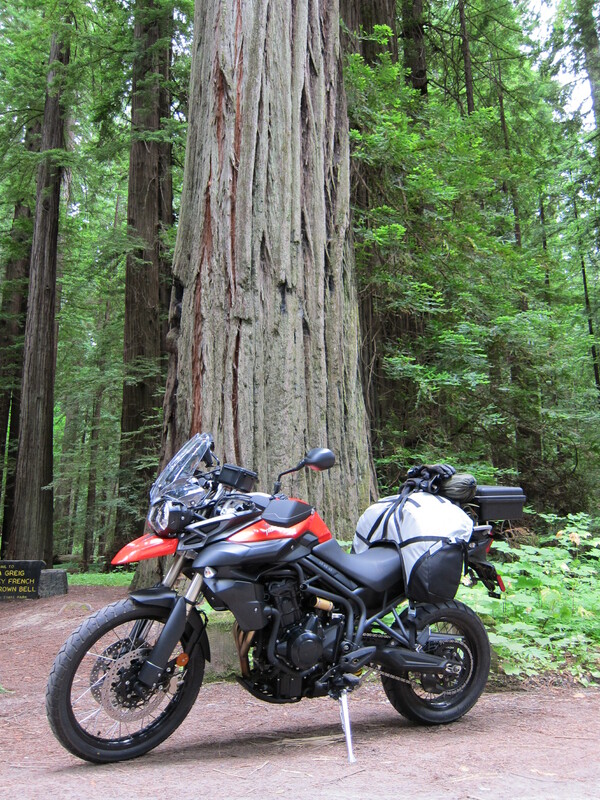 The Tiger by some small trees in California. Photo from July 2011. This small Pelican box is perfect to carry all the small bits for which it is convenient to have quick access. That includes sunglasses, cameras, extra gloves, and other small electronic bits. It fits a laptop as well. Another advantage of this system is how easy it is to unload the bike. Below is a video showing how I unload the bike. In about a minute I’m walking away from the bike with all my belongings with me. Three hand-tight quarter-turn fasteners for the box, four quick release buckles for the Great Basin. One trip is all it takes to get everything out of the bike and walk away from a now completely unloaded bike (note: I had already removed the tent when I made this video, but if that was not the case, it would not had added much time and procedures to the process, as the 2-person, 3lb tent is in a small bag that has a handle). To complete my set up, I have a small Otter box to carry my camera, I-phone and wallet at the bike’s handle bars. The small Otter box. Photo from July 2011. Now, you noticed I don’t have a tank bag on the motorcycle. Tank bags are a practical way for carrying the things to which you need immediate access. However, tank bags are to a motorcycle what those fanny packs are to us. 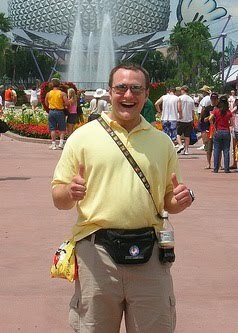 Happy Tourist sporting fanny pack. Photo source? It was a Google search. 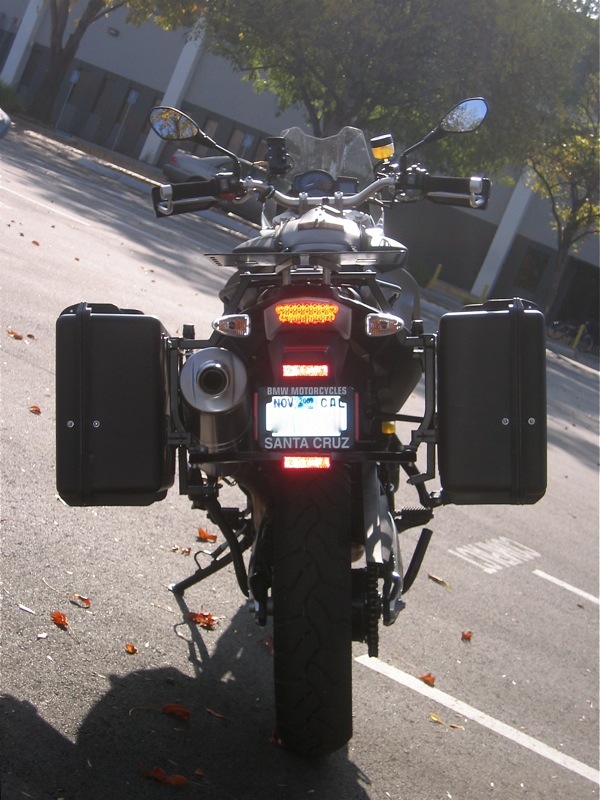 And some people go to the extreme with tank bags, to a point the tank bag gets so tall that they start affecting their sight to the motorcycle dashboard, or to a point that even the riding experience gets compromised. I don’t think you will ever see any of my bikes sporting a tank bag, the same way I will not wear a fanny pack. Although I have to admit they really are practical and the tank bags offered by Giant Loop are reasonably well designed, and small enough. But they are still fanny packs, I mean tank bags. And if I can help it, you will also never see my bikes disappear under a mountain of bags. That is what I call the hobo approach. Some people load their bikes to the extreme, everything goes, and the bike disappears under a mass of seemingly randomly attached gear with bungee cords and other cinching mechanisms. 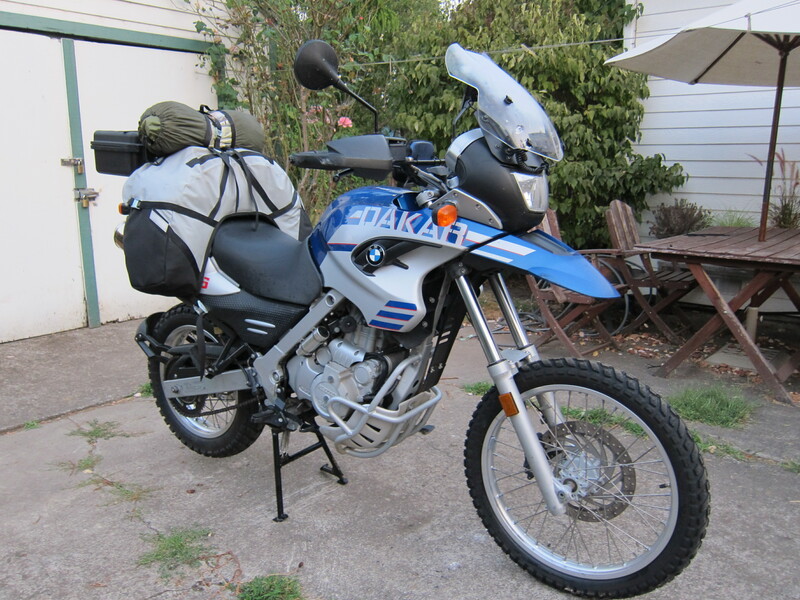 This is the case on this R1100GS photo I found on the Horizons Unlimited site (a great resource for motorcycle overland travel, by the way!). Can you see a motorcycle under there? Of course this approach works as proven by the many people who circumnavigated the earth with all sorts of gear strapped haphazardly to their motorcycles. Part of the adventure then becomes to load and unload this machine at every stop. 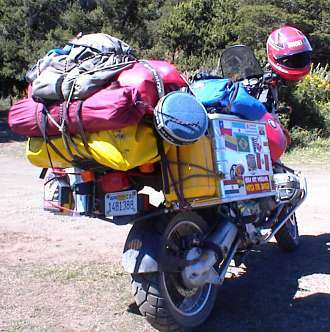 Why not start the trip with your motorcycle loaded with only what is really necessary for the trip? And what about if you could do it without racks and hard side cases? In the end, in doesn’t really matter which way you set your bike for adventure, what matters is that you have fun. But as a rule I would recommend that the “less is more” approach works particularly well for adventure riding. 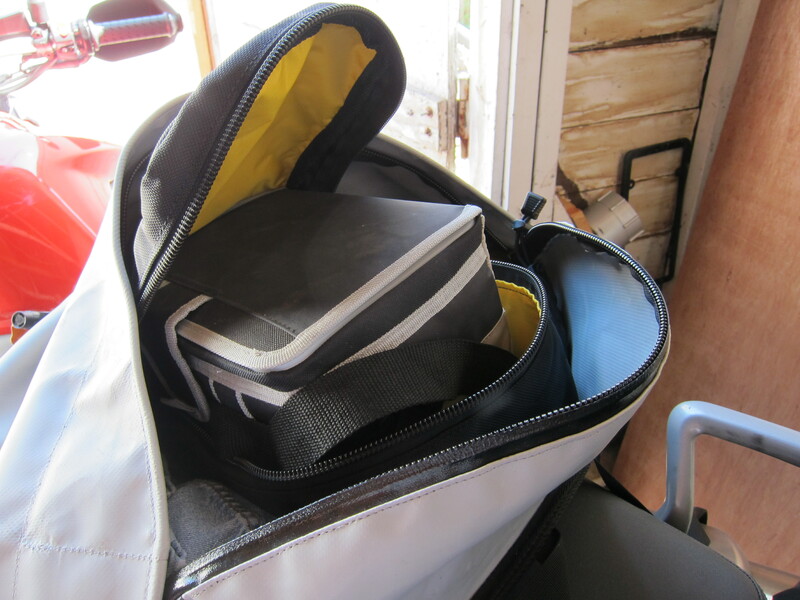 And the Giant Loop bags are one of the greatest options out there to carry your gear on the motorcycle. I wish all of you a great year of adventure riding, where you visit many great places and always return home safely. 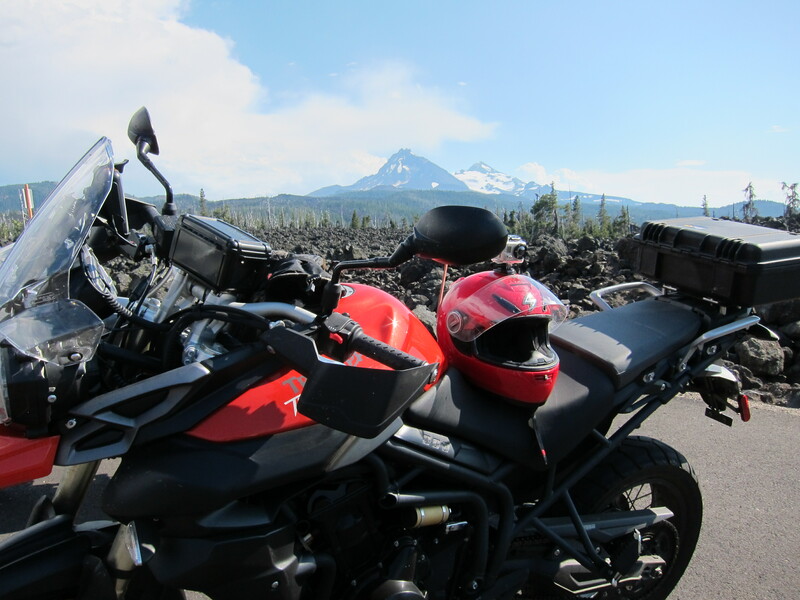 This entry was posted in Product Reviews and tagged adventure riding, BMW, giant loop, giant loop bags, motorcycle, motorcycles, oregon, riding, Triumph, Yamaha. Bookmark the permalink. I like your approach there. I’ll probably try a Great Basin as my next approach to motorcycle luggage mainly as I’m changing bikes too often to buy luggage over and over again. Makes no sense and no fun. Didn’t like the Wolfman bags I had on my WR, though, so I hope the Giant Loop works better for me. You are welcome Guido. I’m sure you are going to like the Great Basin. Question to you: how hard is it to keep the Great Basin away from the hot exhaust on the Tiger? I’d like to use it on my Tiger 800 and have some concerns regarding the exhaust piping and the end can. The OEM exhaust (as well as the Arrows) has a heat shield. No problems at all. Thank you for a interesting article. Yes, you will need a plate of some form so that it will clear the passenger grab handles. For my bike I went to the Pelican website and ordered their universal plate. That is because I wanted to be able to remove the case easily if I so needed (it has three quarter turn fasteners that can be finger tightened as you see in the you-tube video on that post). To install the universal plate I made the holes on the plate that matched the Triumph’s four bolt pattern. I keep the plate attached to the bike. Cool setup! I was just asking about a setup like this on advrider. I picked up a Great Basin yesterday and have a Pelican case on order. I’m a bit relieved to see other people with this setup, only question that remains for me is the Pelican still able to open with the GB bag installed? And vice-versa, can you get into the GB bag with the Pelican on there? Kudos for having a great setup, and going on some nice rides. To me this is the best setup, no wide boxes, and I can walk away from the bike, with all my gear, on one trip.